Hopefully you’ve already read Part 1 of this column where we showed how to get started with a timelapse animation: choosing exposures, frame rates, etc. Now we’ll get to the good stuff and show several techniques for animating the resulting star shots. To do a simple animation using Picasa (free tool from Google) here is how you go about it. Organize all of your identically sized and processed frames into either a single folder or a Picasa Album. Illustration 1: Picasa with a set of images captured in an Album. Would work the same if a directory were used. Select the Album (or directory) and click the Movie option. You’ll get a default title screen. If still in “Movie” mode select “Clips” then “Get More” which returns you to the “Library” mode. Select the slide to use for your Title – e.g. the first, last, a composite, or something altogether different. Make sure it’s the same size as your time lapse. I usually use the first or last slide and use “File -> Save a Copy”. Use the Text Tool in Picasa to add the text you like sized, angled and colored as you please. You can animate the title by changing colors, and other effects, but don’t go overboard just yet – as this is not a very efficient way to create titles! Duplicate the title slide “File -> Save a Copy”. For each second you want the text to appear you’ll need to have enough frames. So, for example for a 1 second appearance at 1/10th of a second duration, you need 10 frames. NOTE: If you want to make the text appear for 5 seconds, you don’t need to make 50 frames, you can make 10 or fewer and reuse them (see step 9 below). In this example I used the first frame, added my text and saved it 6 times (File -> Save a Copy). I selected the 6 identical title frames, and clicked “Back to Movie Maker” at the bottom. I made sure the movie was at the beginning by dragging the slider beneath the window all the way to the left. Next I drag my “clips” onto the beginning of the movie. If I need more title frames, I select “Get More”, reselect the same slides and repeat step 11 until happy. Credits/closing titling can be done the same way as the titles. Oh, and I added music too. Any MP3 file should work. Just use the “Audio Track” option to load it. If you want to start the music at a particular point and do fade in, fade out, or cross fade different audio tracks Picasa is not the tool for you. A more interesting example shows what happens when I start the animation near the middle. I then stack ten frames at a time (using Image Stacker) and animate them. I then stack the stacks of 10 into stacks of 50 (which makes it look like it’s moving faster) and finally I then repeat all the frames from beginning to end. It LOOKS like the movie is getting brighter but what is really happening is you are seeing the moon rise! For another similar example, take a look at this. Be patient though as the good part is toward the end. If you have only a few frames, you can use other modes to create your timelapse, for example this one uses “cut” mode with photos every 1 second. If you want to go even farther, there are still more free tools that you can use, like Windows Live Movie. With Windows Live Movie you can do more advanced titling, have music that fades in and out (only one track at a time, however), and more. This entry was posted in Animation, Picasa, Stacking and tagged animation, composites, creation, credits, Picasa, stacking, text tool, timelapse, titling, video on September 9, 2011 by Steven Christenson. “Star Races” was created using the stacking features of StarTrails.exe (Windows program) and composed into a movie using the “Animation Feature” of that same tool. The vertical format works well with the portrait mode images. This video contains no music or titling as those are not supported by StarTrails.exe. I will cover the technique to create this in Part 2. 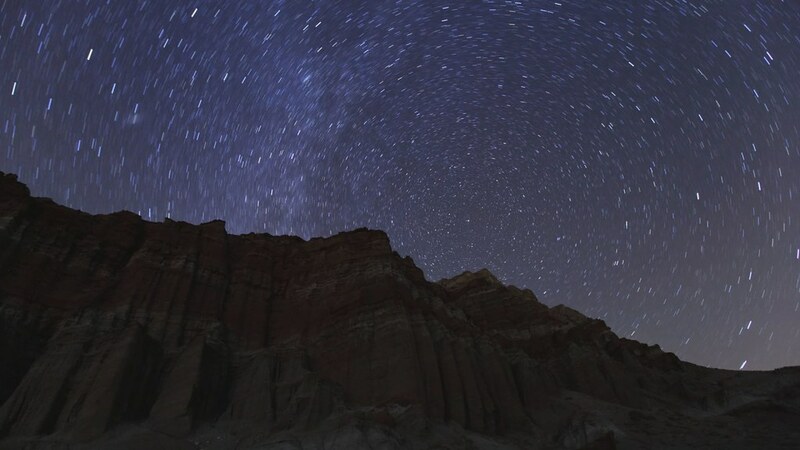 Not all time-lapses need be created from night images, however. An early example of a daylight animation chronicles my son scaling a rock in Zion. I later did a similar animation using a tripod. The method used to create the animation will depend on the number of frames available and the intent. Let me start at the beginning however. 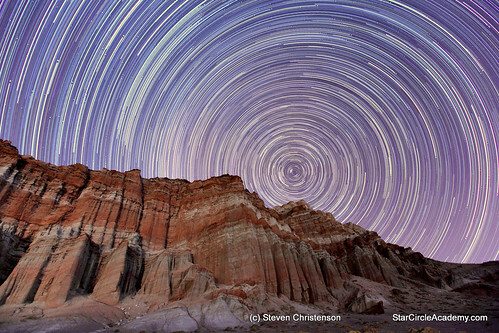 A time lapse requires “frames” – individual pictures used to create the end result. Usually pictures used to create a time-lapse will be at relatively low resolution (1920 x 1080 or smaller) so shooting them in large format, RAW means extra work will be required to assemble them. On the other hand, my time-lapse are byproducts of my star trail shots and I always shoot those in maximum sized RAW mode. An important consideration is the frame rate – that is the number of images shown per second. A movie typically consists of 30 frames per second, so to shoot 5 minutes of video one needs 30 frames per second for 60 seconds x 5 minutes. 30 x 60 x 5 = 9,000 images. Yes, that is a LOT! However often a frame rate of 10-per-second is acceptable, so only 3,000 images are needed – still quite a lot. Perhaps we shall start a little less ambitiously and collect 300 frames – enough for a 30 second animation at 10 frames per second. Assuming we are shooting these at night with 2 minutes each exposure it will take 600 minutes (a mere ten hours!). If that still seems like too much work, we can settle on shooting 1 minute exposures and have the shooting done in a 5 hours. Clearly patience is required. Unfortunately when shooting the night sky it is unrealistic to expect exposures to take less than about 10 seconds even at high ISO. The software used to assemble the video may also impose limitations. For example in Picasa’s time-lapse mode the minimum frame rate is 6 per second and the maximum is 24. In “Dissolve” or “Cut” mode, the minimum is 1 per second. The Zion climbing shot is done in Dissolve mode. Lots of tools exist for this. 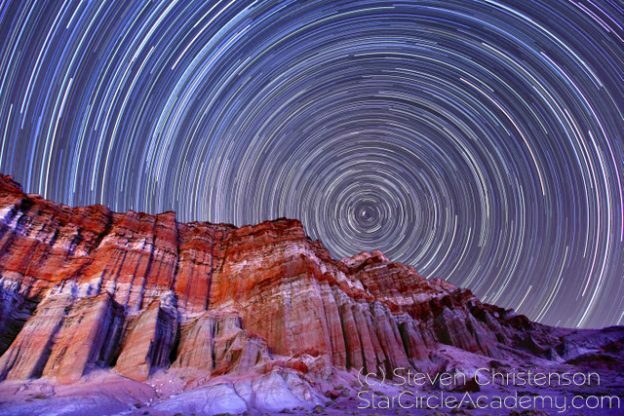 I’ve already mentioned Startrails.exe and Picasa (Mac or PC), but there is also Windows Live Movie Maker. Each of these tools is free! 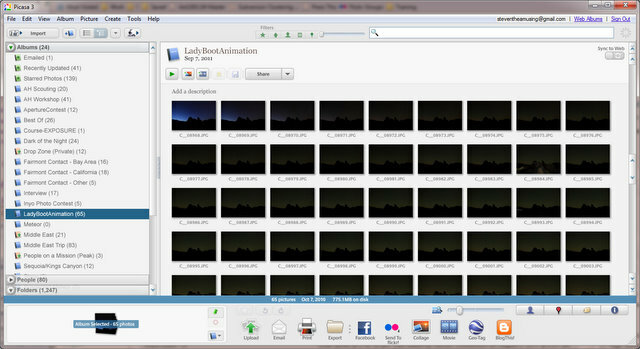 Windows Live Movie Maker is the most versatile free tool I have tried with titling and transition options. Non-free tools for the PC include Adobe Photoshop, Adobe Lightroom, Adobe Premiere. For the Mac there are iLife (iMovie), Final Cut Pro, and many others. While a simple time-lapse may be interesting adding music makes it more so. The free tools support music in some (small) fashion but sometimes just barely. Picasa for example will let you select an MP3 song. Unfortunately when creating a time-lapse it will not let you select where to start in the song and does not fade in or fade out – and only one track is allowed. If you really feel ambitious you can use iTunes to create a segment of a song to include. Search Google for “creating ringtones in iTunes” (which will help you figure out how to create a snippet), and “export iTunes as mp3”. Creating a snippet using iTunes is not particularly easy, fast or convenient, but it is free – and as a bonus you will discover that you have been wasting money paying for ringtones! Copyrights and credits can be done in several ways. Live Movie Maker is actually pretty easy to use and allows different text effects. In Picasa you can use captioning (which is only modestly useful for a time-lapse) or text overlays using the Text Tool. The Text Tool is the most versatile but unfortunately in Picasa you can not say “repeat this frame for 5 seconds”, you have to make 5 seconds worth of frames from one image, or keep adding the one image into the movie. If your frame rate is 20 frames per second, you will have to make, gulp, 100 frames for that 5 seconds of copyright or credit! 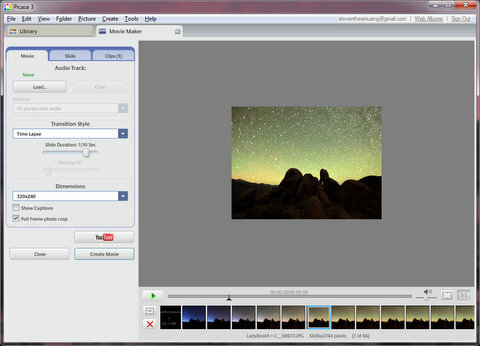 In the next installments, we will show how to use Picasa from beginning to create a time-lapse with music, titles, and credits. This entry was posted in Animation, Creativity, Photo Tip, Timelapse and tagged animation, compositing, credits, frame rate, frames per second, overview, Picasa, timelapse, titling, Windows Live Movie on August 12, 2011 by Steven Christenson.